Michael Masterson is a man with a mission: To help other people get as rich as or richer than he is. ... until, that is, I flew down to one of his renowned seminars. Everywhere I turned, I seemed to get caught up in a conversation with someone whom Michael had personally helped to get rich. It was amazing - a whole huge crowd of people whose fortunes and lives had been changed by one man's ideas, and his generosity in sharing them. Yet the skeptic in me couldn't help but wonder: What was in it for him? So I asked. And every time I asked the question, the answer was the same: Absolutely nothing. No percentage. No stake. No take. 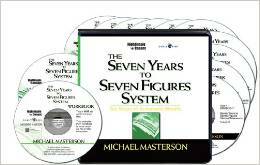 Turns out, Michael Masterson really is just a guy who developed a foolproof system for getting rich ... discovered how great life is when you've got plenty of money ... and now wants as many people as possible to have the same experience. It's as simple AND as extraordinary as that. I'll bet that soon you'll be down in the Florida sunshine, sharing your million-dollar success story with a soon-to-be-converted skeptic!